The above info came from Morino Wakaba, and was edited by yours truly (contact me). The image came from Anime Frontier. Seishun Gakuen Middle School (or Seigaku for short) had a tradition to not take first year students as regulars until after the summer. Then came Ryoma, a genius first year student, son of a world famous pro! Beating a few older students with amazing tennis moves, Ryoma won a seat in the Seigaku regular team! The team's dream is to go to the All Japan Tournament and, of course, win!! This sports anime is a blend of sports, comedy and maybe a bit of romance. The many amazing matches are punctuated with side-splitting laughter! A lot of it is because of Inui's evil veggie/anything else juice, called "Inui's Special Vegetable Extract Juice" (and he has others, like "Inui's Special Golden Power Remix", "Blue Juice", "Red Juice", and "Hyper Penal Tea"). And of course Ryoma has his own mini fan club and a shy little girl that has a crush on him. 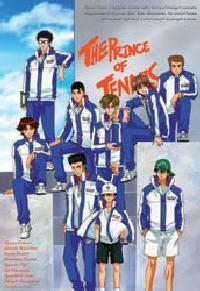 Pick up your racket and watch Prince of Tennis! The above description came from Morino Wakaba, and was edited by yours truly (contact me).